I came across an article lambasting the Australian Antarctic Expedition scientists on board the MV Akademik Shokalskiy trapped by fast ice since Christmas Eve in the Commonwealth Bay region of Antarctica. Climate scientists and tourists are on board the vessel on the Spirit of Mawson voyage, retracing Sir Douglas Mawson's Antarctic expedition. 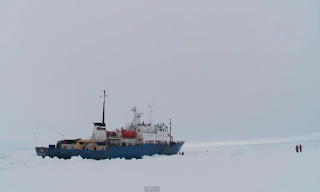 The ship found itself locked in thick ice after experiencing blizzard conditions which moved and piled up ice flows. 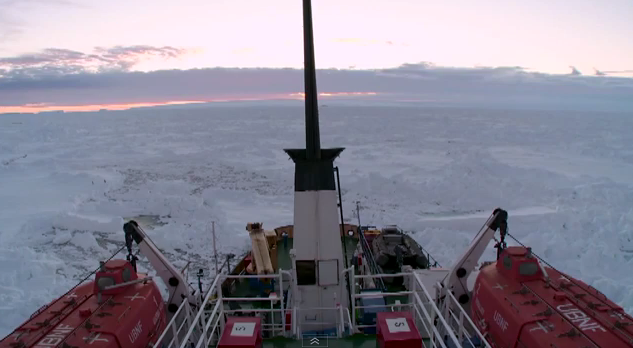 Ships can get trapped by pack ice in polar waters very quickly during blizzards. Pack ice moves around with wind conditions, and it is not uncommon for ships to become temporarily locked in the ice even during peak summer conditions in Antarctica.
. @tan123 @profchristurney Yes because the ice comes from the berg B09B that broke off Antarctica 3 years ago. 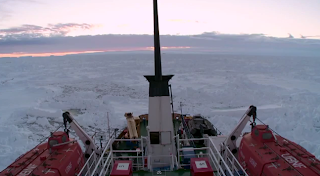 His view probably had it's origins in the climate sceptical website Watts Up with That where Anthony Watts wrote: So much sea ice in Antarctica that a research vessel gets stuck, in summer!. But Mr Greenfield, or Anthony Watts for that matter, made little attempt to explain the complex science involved with understanding Antarctic sea ice. The different geographies of the Arctic and Antarctic - one surrounded by land masses, the other by ocean - mean that different wind, ocean currents, and heat transfer processes occur. Unlike the Arctic where there is a marked long term decline in extent and volume of sea ice, the trend for sea ice in Antarctica shows a slow growth in extent setting new maximum extent records in recent years. The long term trend (1979-2008) shows an increase of 0.9% per decade in Antarctic sea-ice, while Arctic sea-ice shows a decrease of 4.1% per decade (NSIDC). Some commentators estimate Arctic summer sea ice may vanish in the next few years. Nafeez Ahmed reports the US Navy predicts summer ice free Arctic by 2016. Despite slightly higher summer sea ice this year, Sea Ice Volume is Not Recovering. 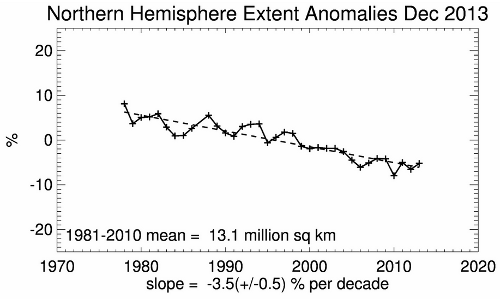 The decadal trend shows a reduction in sea ice on a global level. But there will be inter-annual variability along the way. In 2013 Antarctic sea ice extent was the largest November on record, 5.3 percent above average at 17.16 million square km. The Arctic experienced sea ice extent 6.8 percent below the 1981-2010 average, and the sixth smallest November extent in the 35-year period of record at 10.24 million square km. According to a tweet by Professor Ray Wills (@ProfRayWills), "Winter recovery of Arctic sea ice stalls - 25Dec2013 sea ice extent 3rd lowest on record". 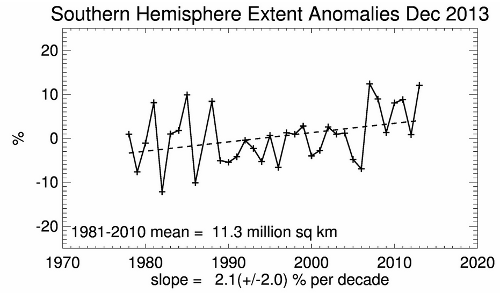 According to the NOAA National Climatic Data Center Global Snow & Ice - November 2013 report, "When combining the Northern Hemisphere and Southern Hemisphere sea ice extents, the globally-averaged sea ice extent during November was 27.40 million square km (10.58 million square miles), 0.4 percent above the 1981-2010 average and the 12th largest November global sea ice extent on record. This marked the first November since 1999 with above-average global sea ice extent and the largest November sea ice extent since 1994." In the early 1990s Syukuro Manabe and colleagues from Princeton University predicted increasing antarctic ice due to increased precipitation (snow) being compacted to ice, using early Global climate models. Although they articulated that there were different processes at work in the Arctic and Antarctic, they found the results indicating Antarctic sea ice increase puzzling. 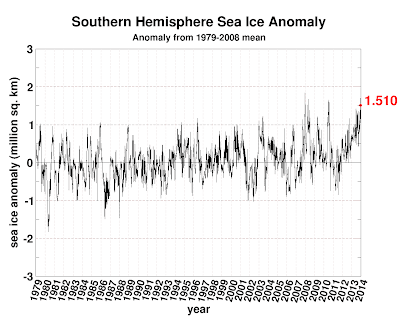 Oceanographic data also find that the waters in the Southern Ocean are warming. The waters of the Southern Ocean's Antarctic Circumpolar Current have warmed more rapidly than the global ocean as a whole. From 1960 to 2000, water temperature increased by 0.068°C per decade at depths between 300 and 1000 metres. This warming trend has increased to 0.098°C per decade since the 1980s (Boning 2008). Later (Markus and Cavalieri 2006) postulated that "Snow depth on sea ice plays a critical role in the heat exchange between ocean and atmosphere because of its thermal insulation property....The results show an overall increase in snow depth for each of the five Antarctic sectors and the region as a whole, but only the Indian Ocean sector and the entire Southern Ocean show a statistically significant increase." In November 2012 I reported on the puzzle of Record Antarctic Sea Ice Growth in an article where I explained that (Holland et al 2012) argued that atmospheric variability in the form of local winds was pushing the ice northwards creating space for new sea ice to form. In my blog from April 2013 on the Antarctic Paradox: ocean warming melting ice shelves causing sea ice expansion I explain the paper by (Bintanja et al 2013) in which they argue that the freshly melted cool and fresh water from the Antarctic land mass forms a surface layer protecting sea ice and helping it's expansion insulating it from the deeper warm salty currents. Antarctic westerlies wind vortex growing stronger, increasing sea-ice? A paper this year (Zhang 2013) by Jinlun Zhang, from the University of Washington, argues that about 80 percent of the growth can be explained by changes in the prevailing winds around the frozen continent - the westerlies; the remaining 20 percent, he suspects, might be the result of changes in ocean circulation. Zhang's modelling work has involved studying of the polar vortex, the winds that swirl around Antarctica and have been growing stronger over the last three decades. The Westerly winds are stronger and have more convergence, shoving the sea ice together to cause ridging. Stronger winds also drive ice faster, which leads to still more deformation and ridging. This creates thicker, longer-lasting ice, while exposing surrounding water and thin ice to the blistering cold winds that cause more ice growth. In the modelling simulation that involved interactions between wind and sea, thick ice increased by about 1 per cent per year from 1979 to 2010, while the amount of thin ice remained relatively constant. "You've got more thick ice, more ridged ice, and at the same time you will get more ice extent because the ice just survives longer," Zhang said. A global sea ice-ocean model is used to examine the impact of wind intensification on Antarctic sea ice volume. 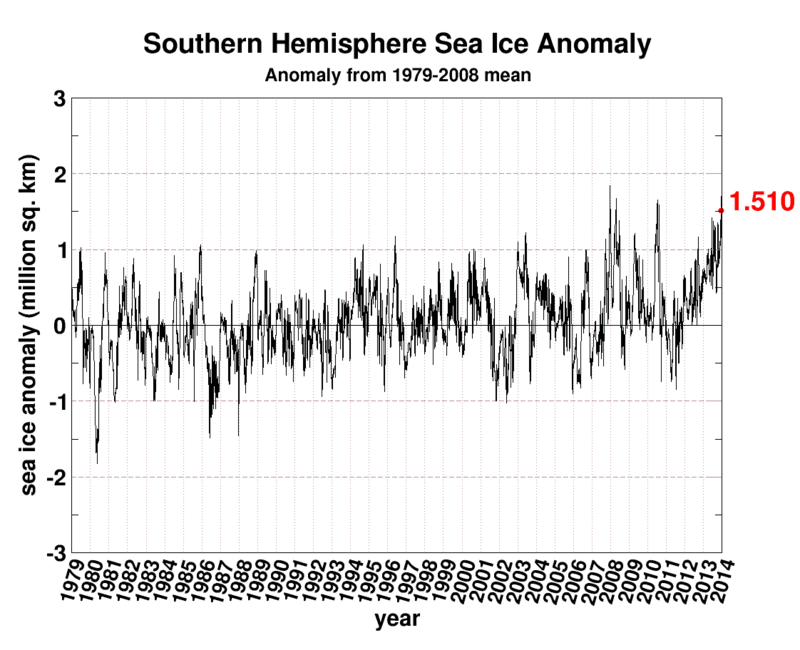 Based on the NCEP/NCAR reanalysis data, there are increases in surface wind speed (0.13% yr−1) and convergence (0.66% yr−1) over the ice-covered areas of the Southern Ocean during the period 1979-2010. Driven by the intensifying winds, the model simulates an increase in sea ice speed, convergence, and shear deformation rate, which produces an increase in ridge ice production in the Southern Ocean (1.1% yr−1). The increased ridged ice production is mostly in the Weddell, Bellingshausen, Amundsen, and Ross Seas where an increase in wind convergence dominates. The increase in ridging production contributes to an increase in the volume of thick ice (thickness > 2 m) in the Southern Ocean, while the volumes of thin ice (thickness ≤ 1 m) and medium thick ice (1 m < thickness ≤ 2 m) remain unchanged over the period 1979-2010. The increase in thick ice leads to an increase in ice volume in the Southern Ocean, particularly in the southern Weddell Sea where a significant increase in ice concentration is observed. The simulated increase in either the thick ice volume (0.91% yr−1) or total ice volume (0.46% yr−1) is significantly greater than other ice parameters (simulated or observed) such as ice extent (0.14–0.21% yr−1) or ice area fraction (0.24–0.28% yr−1), suggesting that ice volume is a potentially strong measure of change. I doubt this is the final study to shed light on this puzzle of growth in Antarctic sea ice in a warming world. More than likely it is a combination of factors to varying degrees as articulated in the various research listed above. The science remains complex. The sea ice growth trend in Antarctica is small compared with the amount being lost in the Arctic, so that there is an overall significant decrease in sea ice worldwide. Zhang anticipates that warmer temperatures will eventually resolve the apparent contradiction. "model predictions suggest that their won't be significant changes in sea ice until 2080. After that point it will actually start reducing quite rapidly. That will have a profound effect on both ocean circulation and the climate system because we won't get that deep water formation. Without seaice there to form this big reflective blanket, we don't have the sunlight bouncing back up into space, so we will have oceans warming to radiate heat and heat the atmosphere and that will modify atmospheric circulation. Essentially there is a number of complex feedbacks which we probably don't understand nearly well enough yet." So the Akademik Shokalski remains trapped since 24 December, 100 nautical miles east of French Antarctic station Dumont D'Urville and about 1,500 nautical miles south of Tasmania. The ship is privately chartered with 74 passengers including both scientists and tourists, many of them Australian, and 22 Russian crew. The Chinese icebreaker Xue Long (Snow Dragon) has already made an attempt to reach the ice-locked vessel, but the ice proved too thick. The French ice breaker l'Astrolabe is also nearby. The Australian Antarctic Division vessel Aurora Australis came within 6 nautical miles, but has had to withdraw to open water due to further Blizzard conditions. 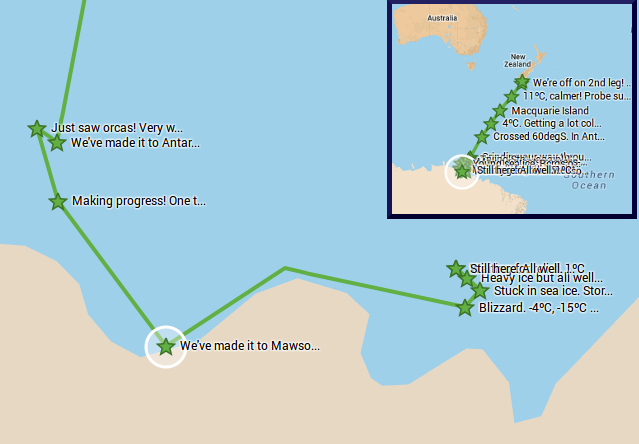 If a second rescue attempt to open a lead to the Akademik Shokalski fails, the passengers can be transferred by helicopter to the Auroa Australis leaving a skeleton crew aboard the vessel for when the pack ice and leads open up later in the summer with wind changes. Australian Greens senator elect for Victoria Janet Rice appears in this Guardian Youtube video published 30 December 2013 from on board the Akademik Shokalski. Janet has a scientific background with her honours thesis on where lows around Antarctica were born and died. She will bring to the new Senate a perceptive understanding of climate science and the need for strong climate action.